Rona Saturday and Sunday April 29 and 30, 2017. 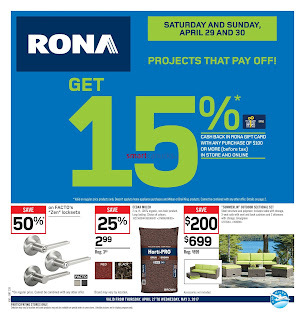 Projects that pay off, get 15% cash back in Rona gift card with any purchase of $100 or more (before tax) in store and online. On cover you find on Facto's "zen" locksets save 50%, Cedar mulch save 25% price 2.99, "Summerlin" outdoor sectional set steel structure and polyester. Includes table with storage 3-set sofa with seat and back cushions and 2 ottomans with storage price $699 save $200. 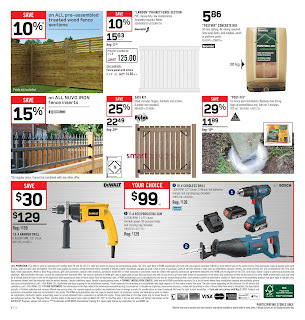 Rona flyer page 2, On All pre-assembled treated wood fence sections save 10%, "Lawson" privacy fence section PVC. Heavy duly, low maintenance. 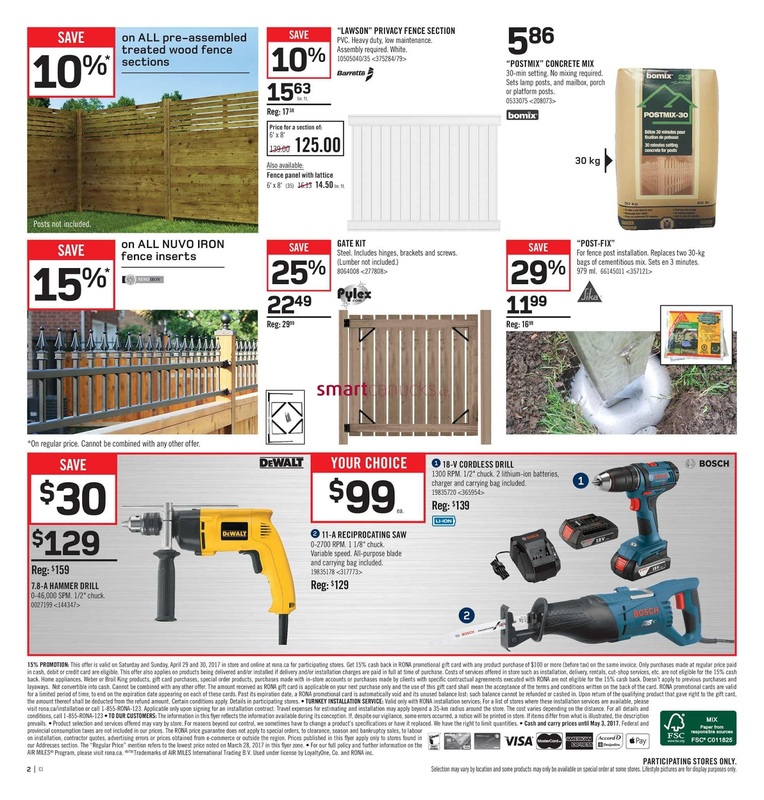 Assembly required white save 10%, "Postmix" concrete mix price 5.86, on ALL Nuvo Iron fence inserts save 15%, Gate kit steel, includes hinges, brackets and screws (lumber not included) price 22.49 save 25%, "Post-Fix" for fence post instalation, replaces two 30-kg bags of comentitous mix. Sets on 3 minutes 979 ml. save 29% price $11.99, 7.8-A Hammer Drill price $129 save $30, 18-V Cordfless Drill 1300 RPM 1/2" chuck 2 lithium ion batteries, charger and carrying bag included price your choice $99. Makita Your Choice, $99 7 1/4" circular saw, Orbital Jigsaw, 11-A Reciprocating saw. 10" sliding mitre saw $429 save $70, 18-v Cordless drill price $159 save $80, Jobsite radio price $109 save $30. 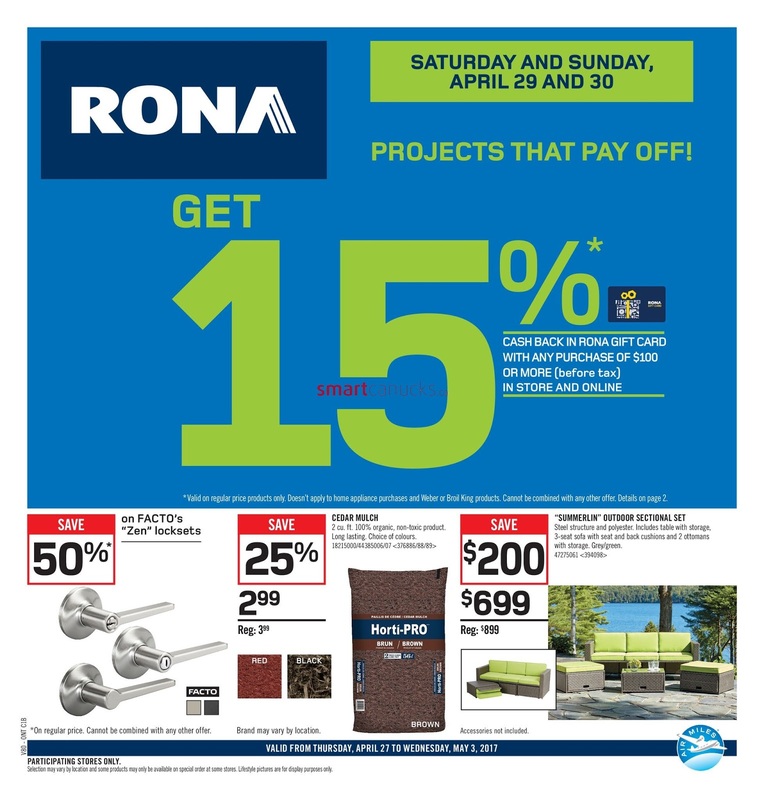 and more yo can check Rona flyer this week at https://www.rona.ca/en/flyer.